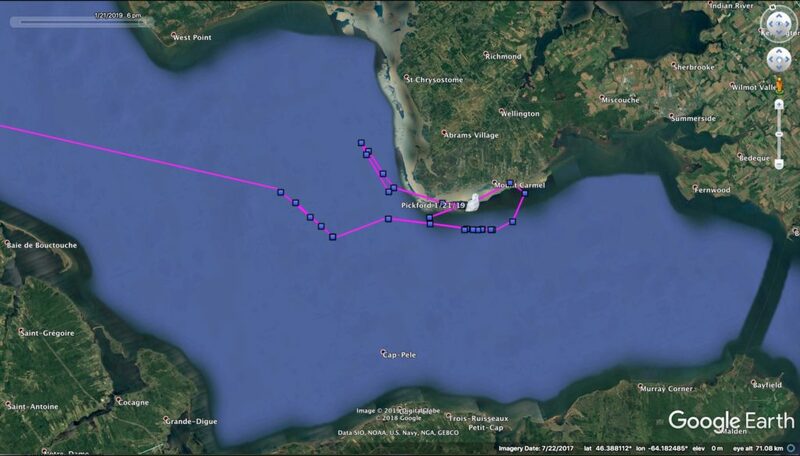 A week or so ago we shared the news that Pickford had come zooming back into range, migrating southeast from James Bay, where she’d been since May, to northern New Brunswick. Well, she kept on moving, and her latest positions — sporadic, because her battery is still recharging from the drain it took to send almost 11,000 GPS points, and browns out occasionally — are out in the western Northumberland Strait, the roughly 30 km (18 mile) wide channel between New Brunswick and Prince Edward Island. She’s loafing along out there, not doing much except riding on the ice as it shifts under the influence of wind and tides, and coming to land on Cape Egmont on PEI’s southwestern coast. Although it had been a fairly mild winter thus far in much of eastern North America, there’s still a lot of ice in these inshore waters, and the recent incursion of Arctic air is freezing up everything that was still open. 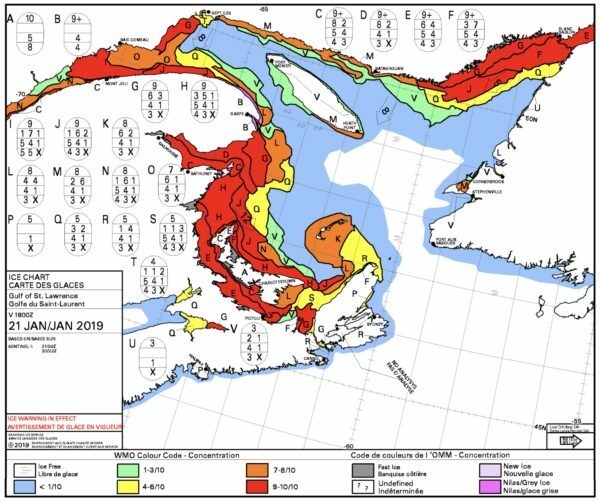 The latest map from the Canadian Ice Service shows all of the strait with an ice cover code of 9, meaning, “Fast ice with close or very close pack ice to seaward of the ice boundary.” Until a few days ago there was a narrow swath in the middle, where Pickford was riding, with a code of 7: “Strips and patches of close or very close pack ice with areas of lesser concentration between.” But that’s solidified now. Meanwhile, all’s mostly quiet on the western front. Woodworth seems to have settled in, at least for the time being, on the farmland close to the North Dakota/ Manitoba border below the Turtle Mountain plateau. He’s using a fairly large area, roughly 20 square miles (32 square km) that includes the Lords Lake National Wildlife Refuge, a small unit of the Clark Salyer NWR complex. Lords Lake is what’s known as an “easement” refuge — the U.S. Fish and Wildlife Service acquired the rights to manage water levels and hunting, but the refuge land itself remains privately owned. Pettibone has likewise settled down for the past couple of weeks in the prairie and grainfields of southcentral Saskatchewan, about 110 km (68 miles) northwest of Moose Jaw. He’s near the mostly dry bed of the Qu’Appelle River, and his nearest neighbors are the 40 or so residents of the village of Aylesbury, along Highway 11 a few kilometers away. Harwood the Highway Owl likes utility poles (hydro poles, to our Canadian readers) along and around I-29 north of Fargo, ND, just a few miles from the Minnesota line. In Wisconsin, Coddington got himself into a mess over the weekend — he’s OK, fortunately, and we’ll have a fuller report later today if possible. Plus we have a couple of new owls to introduce, including an especially exciting one — so stay tuned. We haven’t tagged any new owls on the New Jersey coast this winter, in part because we’ve amassed a large sample size of tagged coastal owls over the past five years, and we’re focusing now on inland and prairie habitats. Of the four we tagged in NJ last winter, two were struck and killed by cars there (Higbee and Hereford), while Island Beach checked in in November from a remote area of southern Quebec, sending all of his summer data, but hasn’t been in touch since — possibly because he’s in an area with no cell reception. The final NJ owl from last winter, Lenape, hasn’t been in touch since he was migrating north in early May in southern Quebec. He may have remained in the Arctic for the winter, as some snowies do; he may be in a place with no cell reception; his transmitter may have malfunctioned; or he may not have survived. We’ve had tagged owls come back after gaps of two or more years, so don’t give up on him.